Mild spoiler alert . 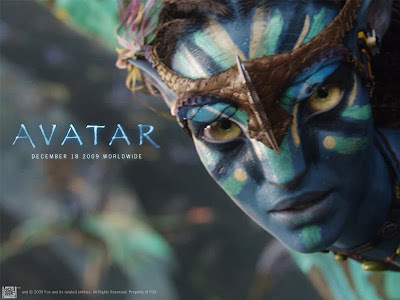 . .
Tonight, my kids and I went to see Avatar in 3D. As I walked out of the film, I heard a man lean across to his wife and say, "This is the best film I have ever seen." Princess Sleepyhead said to me, "That's a keeper", meaning it's one we have to buy the DVD for, and I said, "No, that's not a keeper, that's a let's-go-and-see-this-again film, as in right now." The film reminded me of the passion I used to feel for Star Wars (known these days as Star Wars: Episode 4: A New Hope or just A New Hope to some of the younger generation). I saw Star Wars more than thirty times in the cinemas, could hum the entire soundtrack in order and recite the whole movie. My friends thought I was a freak; my parents thought I was a freak. Well, not really, but it's in their interests not to believe that seeing as I had to inherit such freakiness from somebody. To me it was a passion -- and it's the same thing I get from my writing, or perhaps take to it. I came out of Avatar tonight at 8.40, and the next session was at 9.00. I said to the kids, "Do you wanna see it again? We could go to the 9 o'clock session", and Princess Sleepyhead nodded yes, and grabbed my arm and said, "Really? ", whereas Sir Talkalot tilted his head to the side and said, "Are you joking, because I can't tell whether you're joking or not?" I assured him I wasn't, and only then did he give me an enthusiastic endorsement. Now, unfortunately for all of us, I didn't have a mobile to contact my husband and tell him what we were doing, so we went out in search of a public phone box. There were some inside the shopping centre we were at, but it was already shut. We found one nearby, but someone was in it. Can you believe it? We headed to the nearest large train station, and I was so busy spotting the two there that I didn't notice the traffic island in the middle of the car park and straddled it neatly with all four wheels, crunching the undercarriage of the car, much to my own horror and that of the bystanders. Whoops! No damage done to anything luckily, but by then I was too shaken up to do anything but drive home. The repeat will have to wait now until Tuesday as we have something on tomorrow, and I have a solstice party tomorrow night. I completely bought into this film and was swept up by it and its splendor. James Cameron's wait for the technology to catch up with his vision so that he could do this film was worth it. I believed in the Na'vi in a way I could never believe in the Ewoks. To me the believability is all in the eyes of the character, and whether they can use their eyes to express emotion. The Na'vi could. Chewbacca could. The Ewoks had buttons for eyes. Go figure. I have the website open as I'm writing this, listening to the soundtrack. I can tell already that I'll be buying it in the next day or so: it's good writing music -- my last four writing albums were the three Lord of the Rings soundtracks and Gladiator (oh, and also "More music from Gladiator"). This is similar and different, just what I'm looking for. Already some of the leitmotifs are embedding themselves in my brain. Okay, so see the movie already. This one has shot up into my top ten favourite movies of all time, and that's saying something considering I've only seen it once! Tom, my 8 year old, has been watching the trailer over and over and desperately trying to convince the whole family to go see the movie. I couldn't work out why he thought we wouldn't be going because Wow! but it turns out my oldest is having one of his anxiety responses and doesn't want to go. He'll come round eventually though. I liked it too, but am a little more critical of the plot than you. However, the realisation of the SF elements is magical. Will certainly go see it again! Great to hear from you! Have you seen it yet? Maybe you could go without your oldest if it's really worrying him -- or would you rather he face up to such things? Ellen, yes, I read your review on your blog. I must say one of my favourite moments is one of Jake's stupid ones, but I completely understand it. It's when Jake first goes into his avatar body and realises he can move his toes -- the absolute joy on his face -- and then of course he gets up and knocks everything over and bursts outside, despite everyone else's warning. I completely buy this. (I'm less convinced by Grace's first interaction with him as an avatar, when she's been so hostile as a human only moments ago, but there you are!). We all went, David's objections boiled down to not wanting to see a movie about "stupid blue mutants" which I had a little difficulty taking seriously! I was pretty unimpressed with the plot and characterisations, but it was certainly very pretty. I think I need to watch it again to really decide what I think but that can wait for the dvd. The 3D gave me and Tom a headache, we'll have to stick to 2D in the future. yeah, that was definitely a moment of total stupidity that annoyed me! Mim, yeah, I've heard of a few people getting headaches. We went to see it in Imax the other day, and I noticed in that you had to be looking at the screen straight on or it went blurry, which didn't seem to happen in the normal cinema. Interestingly, there was one bit of translation in the subtitles missing! I have to say I love the plot and don't have any trouble with the characterisation, although others have. I loved them! Ellen, that's funny. I thought it might be. Whereas as I've said I totally love that moment! It is stupid, but I completely believe that's what he'd do. And he is impulsive all the way through . . .